My digital mestizo senses were tingling as multimodal writing and Chicanidad in the Southwest were brought front and center for a wave of excellence in theory, teaching and aesthetics. We were extremely fortunate in February to have so many great speakers at SCU. 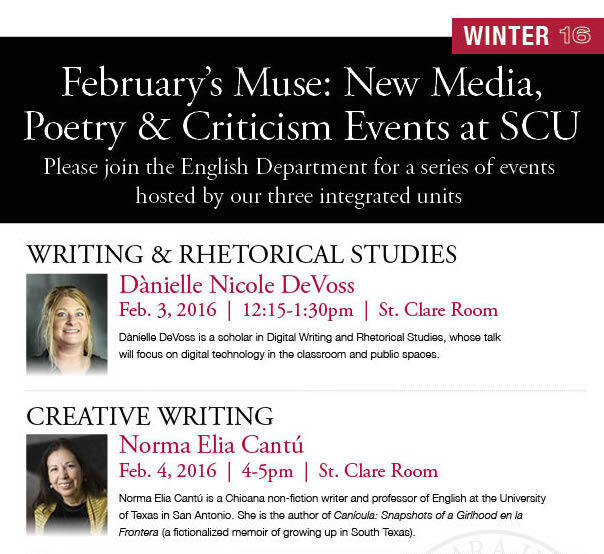 Dànielle DeVoss gave a talk for faculty and students on digital writing in the 21st Century, in addition to a workshop for faculty, and Norma Elia Cantú met with students and gave a reading from Canícula: Snapshots of a Girlhood en la Frontera . Dànielle DeVoss was extremely generous with her time, meeting with members of the writing program faculty to discuss digital and multimodal writing curricula, assignments, and assessment. I was fortunate enough to speak with her about some ideas for my summer course (more on that in a future post) on teaching with technology. DeVoss helped define Digital Writing for the different incantations of Digital Humanities projects across campus. DeVoss outlined Digital Writing Matters as: (requiring) critical thinking, networked, collaborative, multimodal, remixed, policed--and policy(ed). Students and faculty took part in an engaging talk that provoked questions about critical media literacy and the ethics of online composing. Students responded well to DeVoss's uses Lolcats to explain the collaborative aspect of writing in online environments. Examples of professional online media and student projects provided inspiration for what is possible for writing instruction in the 21st Century. During Norma Elia Cantú's talk, she described some of the sexist standards expected of women, where she grew up in Texas, evidenced by the book one of the women in her family wrote about the proper manners for women. Cantú spoke lovingly of her brother who died when he was young, and she described her writing process as extremely unregimented, writing best in the middle of the night. I particularly enjoyed the visual aspect of Cantú's reading that she explained came from her academic training in semiotics, an often ignored visual mode of literacy that many print-based writers do not employ in readings. My students who attended drew comparisons to Anzaldua's Borderlands, which they read in their fall first year writing. They identified with the connections among identity, culture and language. One of the exciting projects that Cantú has also been working on is the translation of Gloria Anzaldua's Borderlands/La Frontera into Spanish.